Exploring the origins of everyone’s favorite pastime uncovered interesting results. I’m liking these silent comics. It’s complete coincidence that there was two in a row. Really. This entry was posted on Monday, April 6th, 2009 at 12:00 am and is filed under Comics. You can follow any responses to this entry through the RSS 2.0 feed. Both comments and pings are currently closed. sorry, don’t wanna leave too many comments but i forgot something. Timeconsumer, Massive Pwnage does not endorse or encourage Birding unless it is in season, with the proper license as issued by the Daemon Dice Office of Fish and Wildlife (DDOFW). 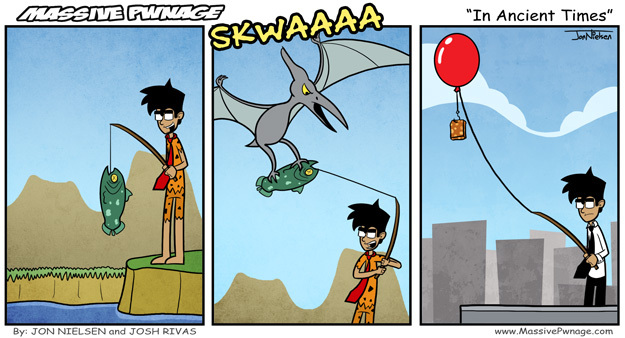 Joking aside, I don’t think people would like the thought of other people catching birds with a hook. Originally, I wanted to attempt this sport with a plastic spoon with a glob of peanut butter covered in birdseed. The original comic shows the pelican clamping it’s beak on Peanut Brittle, because we thought of the same dire suffering a REAL bird would endure as a result of biting on a hook. We don’t really go Birding, although I certainly jest about trying it out. As for the merch to buy, I suggest going with something you’ll see a lot of use out of. I apologize for the pricing of the shirt, it’s not our pricing, it’s the cost of manufacturing the shirts elsewhere. We would order it in bulk and sell it for much less, but as we are still a fledgling comic, we don’t have that many people buying our stock. My personal opinion is that so long as you buy a product from us that YOU will enjoy, it doesn’t matter if you buy a shirt or a bumper sticker. It makes us happy that you choose to support us, and show off your cool purchase to your friends. Maybe someday I can get Ence to design a new shirt, that way people have more of a choice in what they can buy. Yeah, those dumb shirts are way too expensive, but that’s the only way we can offer them right now. I’ve actually been considering redesigning the birding shirt, so you might want to wait for that haha. Wouldn’t be too different though, just different clouds and Locke drawn the way he is now. I have the mousepad. It’s pretty cool.